If you’ve ever been camping, you know that there are a host of critters just itching to steal your food. Sometimes it feels like they’re hiding just at the edge of the clearing, watching and waiting for you to leave your Spam unattended for just one second. What if, though, instead of always protecting your food, you got to be the thief just once? Scavengers is a card game that gives you the chance to play as the sneaky critters and steal food with abandon. Just watch out for that bear. The Hamburger family is on a camping vacation, but they aren’t very careful with their food. 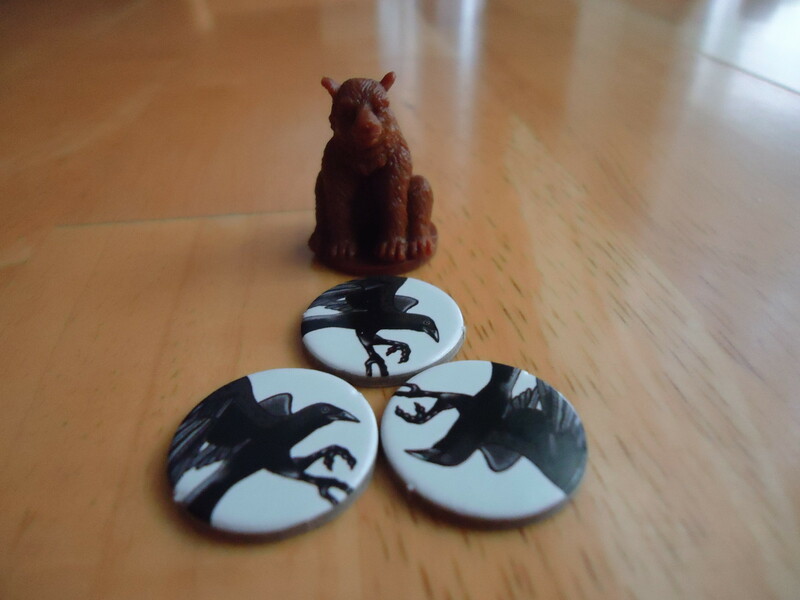 In Scavengers, you’re playing the role of the critters, trying to steal the leftover food and complete your food cards before the other players complete theirs. To do this, you’ll be playing scavenger and event cards and trying to earn enough points to gain control of the various campsites and their associated food scraps. 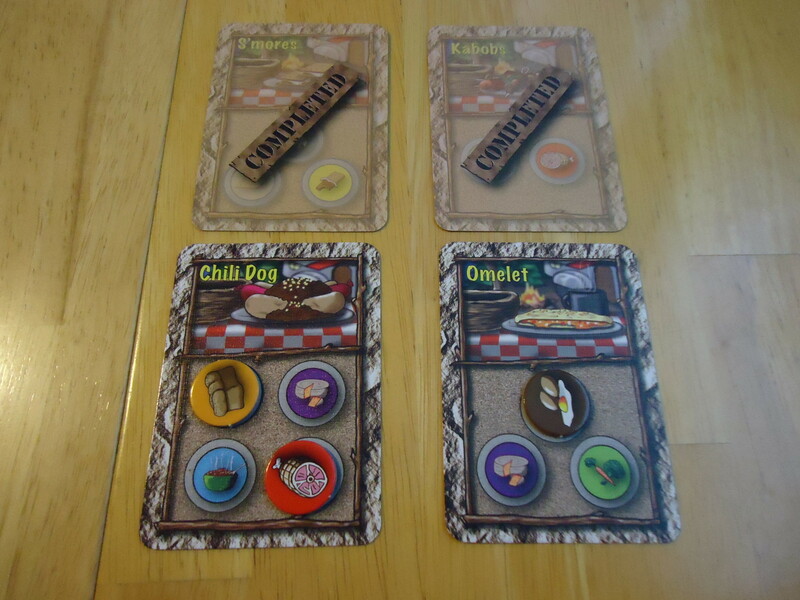 At the beginning of the game, each player is given four food cards. There are four types of food cards and all players get one of each type. These cards have spaces that you must fill with the matching food scrap tokens. 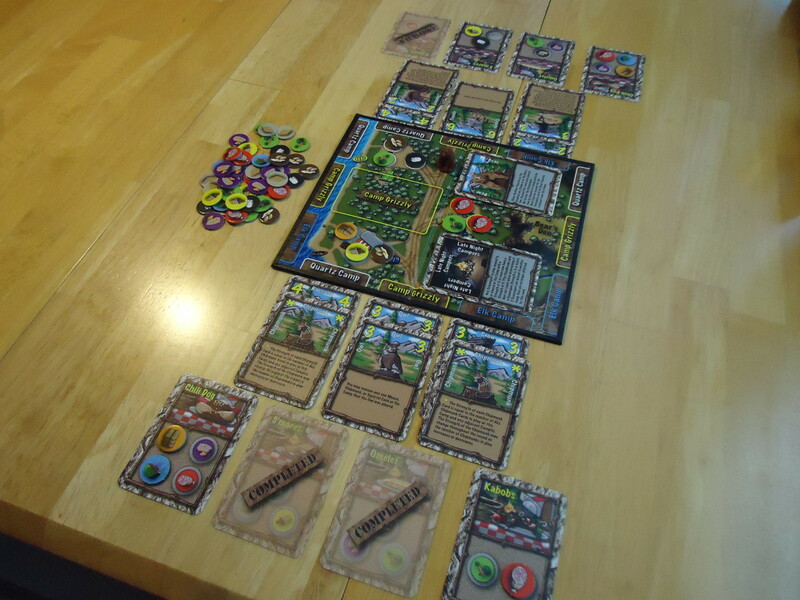 Without looking, each player takes three food scraps from the scrap pile and places them however they wish on their food scrap cards. These are the only “free” scraps you’ll get in the game. 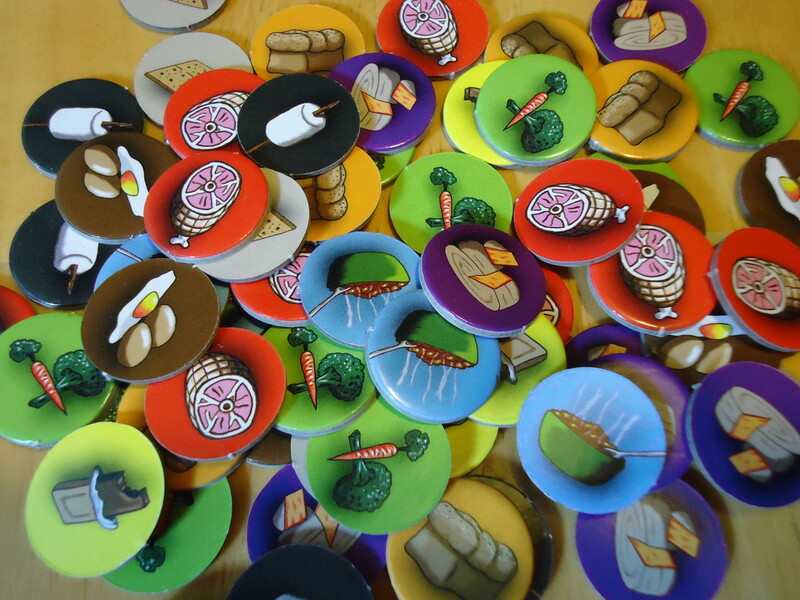 At the beginning of the game, each player is given four food cards, which have spaces that must be filled with matching food scrap tokens. Players get to draw three random food scraps, the only “free” scraps you can get in the game. Each player is also dealt a hand of scavenger cards. Tan scavenger cards are played to your personal playing area, while gray scavenger cards are played on the camps in the center of the board and affect everyone. This initial hand is the only one you get; there are no additional card draws during the game. The final setup step is to assign food scraps to each camp. 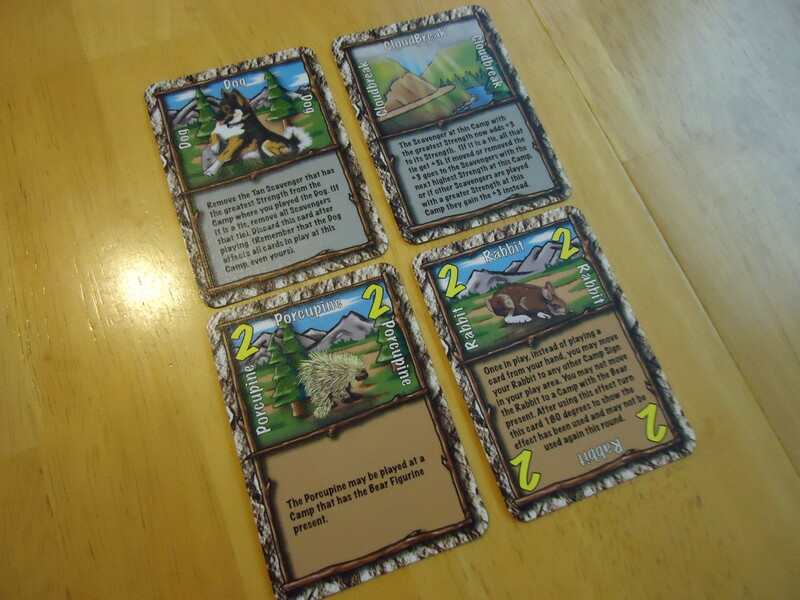 Players take turns drawing cards from a camper card deck and placing the indicated scrap on a camp of their choice. On your turn, you play one card from your hand. If the card has an effect, that effect is calculated/played immediately. Cards may cause your scavengers to gain or lose strength, to block off play to certain camps, or allow you to remove/add/switch food scraps around the various camps. Cards are placed in such a way so that everyone can see each player’s strength for each camp at all times. Once all players have played all their cards, the round ends and scoring takes place. The player with the highest strength in each camp wins that camp’s food scraps. However, if there are players who have played mouse cards to a camp, those players get to select one food scrap of their choice first, even if they didn’t win the camp outright. It is possible that the person who wins the camp may not get any food scraps if enough other players have mouse cards in play. The earned food scraps are placed on your food cards in any matching vacant space. If you fill a food card with the matching scraps, you turn that card over to indicate that it’s been completed. If no one has completed all of their food cards at the end of the round, another round is set up and play continues until someone completes all of their food cards. First one to complete all of their food cards is the winner. When I bought this game, I thought I was getting a quick filler-type game that would be great to take on our camping vacations. Well, I did end up with a game that’s great to take on our camping trips, but a filler it isn’t. I don’t find this to be a bad thing, but I do have to prepare new players for the depth and length of the game. The box is small and the art is cute so people see it and think, “Simple filler game. This’ll be over in fifteen minutes.” When they’re still at the table an hour later with their brain on fire, they’re either thrilled or angry. I’ve learned that proper management of player expectations is key to enjoying this game. Even though it’s s small game, there is plenty of thought here. You’re playing the tan scavenger cards on your side of the board to build up your strength at each camp so that you can take all the food scraps. And if that’s all that was going on, it would be a simple game. But there are also cards that are played to the center of the board and affect everyone, including the person who played them. So, for example, if you play a card that reduces the high-value cards down to a strength of zero, that effect is going to apply to you, too. So do you really want to play that card, or will it hurt you more than it will help? There are plenty more dilemmas to work through. There are cards that let you remove cards from other players’ play areas. Do you want to play those cards early in the game to neutralize an early threat, or do you want to save them until you know more about your opponents’ strategy? Do you want to deploy the bear card early in the game and block a campsite from receiving any more cards, or do you want to hold on to the bear until you’re sure your opponents can’t counter him? Do you need to win a whole camp, or will just keeping a mouse card in play give you the food scrap you need? Or, if there aren’t any food scraps that you need in play, how can you best slow down your opponents and force another round? And those are just a few of the things you have to think about and account for as you figure out the best way to use your cards. Almost every card forces you to make a decision about whether to try to gain the upper hand now, or hold on until the end. And just when you think you’ve got it figured out, your opponent will likely have some card that you didn’t account for that will ruin all your carefully laid plans, leaving you to scramble for Plan B. It’s a delicious game of tug of war. The fact that there is no hidden information makes the game even more strategic. You can always see what each player’s strength is at each camp and whether they have any mouse cards in play. You always know which food scraps they need to complete their cards, and you know which scraps are in play. You do not draw additional cards during the game, so you know from the beginning exactly what you have to work with. Everything is open, leaving you free to calculate your best strategy on every turn. Despite the brain burning play style, the game is easy to learn, even if the strategy is difficult to master. The rules are simple: Play a card and complete your food cards. The cards clearly explain their effects and there is a card glossary with scoring examples in the rule book if you need additional clarification. 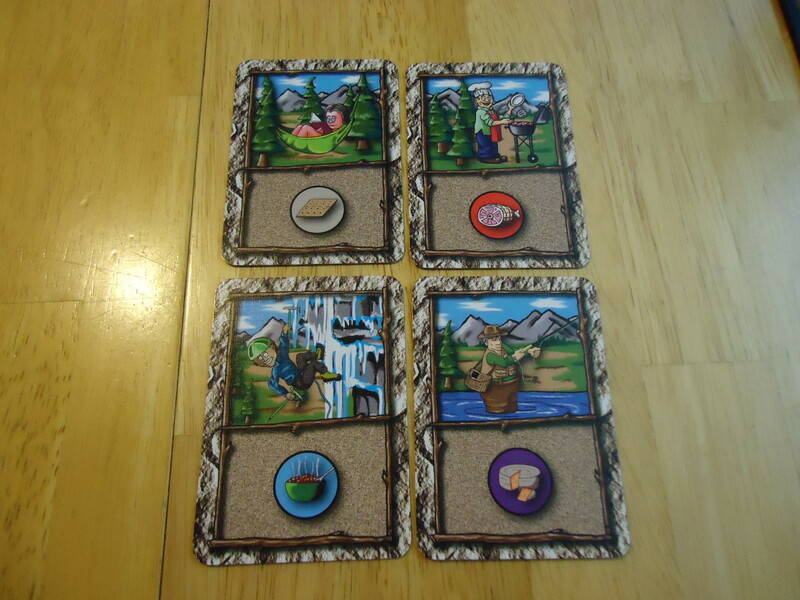 My only complaint with the components has to do with the camper cards which are used to assign food scraps to the board at the beginning of the game. The art is funny on these cards, but they aren’t really necessary to the game and they add time to the game without adding value. The same thing could be accomplished much quicker by having players blindly draw a food scrap and place it in the camp of their choice. If you just want to look at the art on the cards, by all means do it the prescribed way but if you want to save some time, just go with the blind draw method. Camper cards. Cute, but ultimately unnecessary. The only negative to the game is the “take that” and “screw your neighbor” style of gameplay. Don’t let the cute, fuzzy animals fool you; this game can be mean. You can have your cards stolen, or the food scrap that you desperately need can be moved at the last minute from the camp that you tried so hard to win. You can play a card at the last minute that reduces everyone’s strength on a camp to zero, negating all of the work they put in during the round. There really isn’t a way to play nice and win. If you’re not up for this sort of gameplay, Scavengers isn’t the game for you. If, however, everyone can be a good sport about it, the game can elicit some laughs and good natured groans. That negative aside, I find Scavengers to be a great game. The theme and portability makes it great to take on vacations. (You can easily ditch the box and put the components in a bag, and that bag gets even smaller if you leave the camper cards behind.) It’s challenging enough to be a main event-style game, but not so hard to learn that people get frustrated. If you meet other people while on vacation, it’s easy to invite them over to join a game. Anyone who’s played some basic card games can grasp the rules. Finally, while the game can take up to an hour (or a little more if the food scraps that people need aren’t coming out on the board), it’s a fast-moving hour that doesn’t feel painful at all. Turns are quick and while some people can take a while deciding which card to play, the choices are limited enough that even the slowest players can’t take that long. 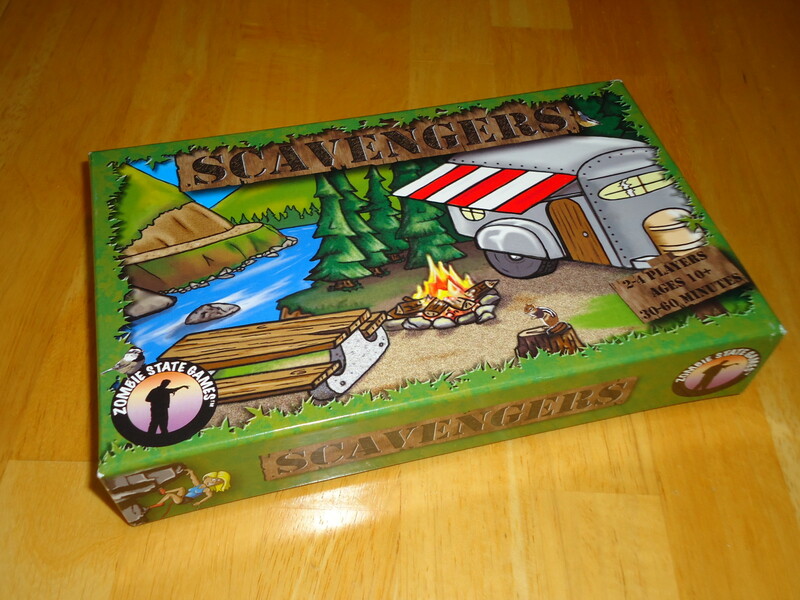 Scavengers is a social, breezy, fun experience that will give you a challenge without exhausting you. In other words, it’s a perfect summer game. Fun theme and portability make it great for campouts, vacations, and picnics. Surprising depth and strategy for such a small game. Simple rules, clear card text, and card glossary make this an easy game to learn. That artwork on the cards and board is attractive, colorful, and suits the theme perfectly. No hidden information improves strategic gameplay. Camper cards are unnecessary, even if cute. Can save time by simply blind-drawing starting food tokens. It looks like a filler but is actually 'main event' length. The wrong expectation can cause frustration for those hoping for a shorter game. Lots of 'take that' and 'screw your neighbor' gameplay may frustrate those who don't enjoy this sort of game.